Completely remodeled turn of the century lake home. With all the original architecture, this home has TONS of appeal to vacationing guests! 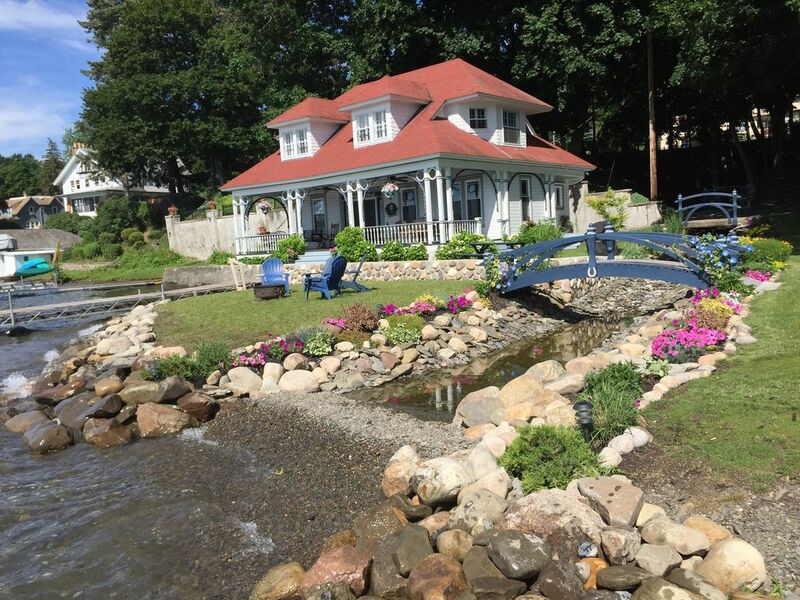 A rare find on Keuka Lake, and only a mile from Penn Yan, this 3 bedroom 2 bath Victorian home was lovingly upgraded in 2006 and has panoramic views of the lake from every room in the house. The remodeled well-appointed kitchen features stainless steel appliances, silestone countertops, wine glass holder & wine rack, maple cabinets, ceramic tile floors & a ceiling fan. It is well-stocked with all the spices, utensils, pots & pans a gourmet chef could need! The dining room has panoramic lake views, country style dining table w/bench & chair seating for 10 & a ceiling fan. The spacious living room with breathtaking lake views features a huge field stone gas fireplace, which heats the entire first floor! A flat screened t.v. and a DVD player are in the living room which can be enjoyed from every angle in the room. Two ceiling fans in the living room circulate the air to keep the home cool. Summer breezes off the lake can be enjoyed through beautiful French doors that open to the large covered porch, which also features 2 large ceiling fans. The house has air-conditioning in the upstairs bedrooms. The master bedroom has a queen bed, window seat for quiet reading space, a ceiling fan, a flat screen TV, and panoramic views of the lake. The 2nd bedroom has 2 twin beds, (which can be changed into a king sized bed), a queen futon, as well as a set of bunk beds. It also has ceiling fan, a flat screen TV , a DVD player, and has panoramic views of the lake as well. Both are upstairs. The 3rd bedroom is on the first floor. It is off the living room and down a few stairs. There is a double bed and a ceiling fan along with beautiful views of the lake. The first floor living room has a queen and a full sleeper sofa for additional sleeping arrangements. First floor bath has a shower/tub combo. Second floor bath has a jetted Jacuzzi tub/shower, with a washer/dryer in the closet. A canoe & paddleboat, along with several life jackets, are available for your use. You only need to take a few steps into the house, out onto the large covered porch, onto the dock or into the water. Perfect for all ages! Kirk and Barbara Vieselmeyer purchased Eastview Cottage in the summer of 2015. We purchased Eastview Cottage because we own the blue cottage,Lake Lawn Point, next to it and we always loved the architecture of Eastview. We purchased Lake Lawn Point in 2011 and completely renovated it as well as our guest cottage , Sin Cottage. It is called Sin Cottage because back in the late 1800s the women didn't approve of the men's smoking and drinking habits so Sin Cottage was built for them. Sin Cottage is our guest home but it usually is occupied by our family. We have 4 married sons and are thrilled to have 8 grandchildren with another one on the way. We embrace family time at our lake home and we enjoy meeting new guests each year. We purchased Eastview Cottage because we own the blue cottage next to it and we have always loved the architecture . It was part of the Lake Lawn Estate once and we wanted to keep it's history in tact. We feel that location is the key to owning a lake home. We are five minutes from Penn Yan and when you have a family and many guests there is always something that we need in town. Or after a fun day at the lake we might just order some food from town. We also are close to many wineries and breweries as well. Having a hospital near by is a big advantage too. The water is pretty shallow and usually warm. We have very friendly lake neighbors that we enjoy socializing with. Dan and Nancy Brooks are the owners of the nearby Colonial Hotel. They clean and provide the linens for Eastview Cottage. They are always available to help you with any concerns that you may have and they are located directly across the street. Washer/Dryer for your convenience in Bathroom 2. Optional charge for one delivery of linens & bath towels is $15.00 per guest. Only minutes to downtown Historic Penn Yan with shopping, museums, restaurants and more. House is shielded by trees for privacy and cooler temperatures inside. Near end of lake so quieter than other areas on the lake. Panoramic views of the lake from almost every window in the house. Only steps to the lake, can't get any better than that! Air conditioning is provided throughout the home. For an additional cost of $15.00 per guest , linens & towels can be provided for everyone. Washer/dryer located in second floor bathroom. Washer /dryer located in second floor bathroom. Relax by the gas fieldstone fireplace, which heats the entire first floor. Parking for 3-4 cars is directly available behind our lake home with additional parking on road & across the street. Please contact us if you need more parking. Wireless internet is available for all to use. For an additional cost of $15.00 per guest, linens & towels can be provided for everyone. Large living area with gas fireplace, both a queen & full sleeper sofa & french doors that lead out onto the spacious covered porch. Well-stocked with a large selection of spices, coffee, dry creamer, oil, sugar, artificial sweetener, pancake syrup and more. Enough for everyone and more! Completely remodeled & well-appointed with new appliances, a large selection of utensils, and pots & pans. Country dining with 2 large benches and 4 chairs for seating up to 10. Also, plenty of room to dine on our large covered porch. There's a large flat-screen TV in the living room with 2 additional TVs in second floor bedrooms. Cable access is on all 3 TVs. Relax by the fireplace and listen to the radio or play your own CD. A DVD player is located in the living room and bedroom number 2. Board games and playing cards are available to help wind down after a busy day. A canoe that seats 2 and paddles are available for your use. A peddleboat that seats 2 is available for your use. Relax or entertain on our large covered porch--rain or shine. The views are spectacular! Enjoy the views of the lake from our small deck by the front door. Life jackets, in several sizes, are available for your use. The first floor is wheelchair accessible with easy access to the bathroom and the front porch. The pull out sofa would be available for sleeping. High speed wireless Internet access is available on premises for use with multiple computers. Tour the local beverage trails, eat wine ice cream & buy novel gifts--have Park Place Limo pick you up & drop you off right in front of our home. Visit the Windmill Farm & Craft Market, open Saturdays with over 200 vendors, or dine at any one of our popular local restaurants. Play golf or mini-golf, see a movie or shop quaint main street Penn Yan. We provide a paddleboat and canoe for your convenience but you can also rent watercraft. There are several area marinas & boat launches that offer watercraft rentals & other services. Just down the road you'll find Indian Pines Farmer's Market with home-made jellies & baked goods, fruit, veggies & more; Seneca Farms Ice Cream with a variety of ice cream & specialties; & a local park--all within walking distance! Do some sightseeing and visit water & theme parks, museums, zoos, outlet malls, Niagara Falls & more! Wonderful house right on the lake. Amazing views, everything we needed and more. Exceptional! We had a wonderful time at this property. There was four of us (2 couples), and the House was just right. Very clean, well stocked, above average +. The views of the lake, sunrise and sunsets from the porch, and dock were outstanding. Paddle fans on the porch and each room. The AC was nice as we hit a hot spell in September. The owners are very nice, very helpful, went the extra mile for us. We brought our own kayaks, and we could launch right in front of the house. Keuka has very clear water, very nice. We kayaked 2 days at Keuka, and 1 day at Seneca, for a total of about 15 miles. It was nice that Watkins Glen was only 35 minutes away, which gave us variety. We ate at restaurants in Penn Yan (very close) and also in Watkins Glen. Many good choices. This house and property is amazing. We were able to catch fish, the two fisherman each caught a 17” smallmouth bass, as well as other fish. Again, amazingly nice, clean, well kept well stocked house. We would like to return at some point. Thank you for allowing us to stay here. We loved it. The property was outstanding and had everything we needed! It was very clean and the parking right behind the cottage was great NO STEPS!!! We recently stayed with family at Eastview Cottage and we can honestly say it was our best experience yet! We have rented many times on Keuka Lake but we enjoyed this property the most. It was nice not to have a killer set of stairs to go up and down and the landscaping on this property just added to our enjoyment. It is a great mix of old outside (the beautiful porch) and new inside with many updated ammenities. Kirk and Barb have done an amazing job at making this a comfortable place to stay. We would also like to thank Dan and Nancy at the Colonial Motel for their hospitality during our stay. We look forward to coming back again soon! Our family really enjoyed the cottage. We loved the location, the layout, the beautiful porch and the great access to Keuka lake. The cottage was clean and well maintained. It was also well stocked with amenities in the kitchen and bath. The 2 upstairs bedrooms do get a bit warm, but there are lots of windows, fans and air conditioning, if needed. Our week at this gem couldn't have been better! Our family just rented this lovely home for our second time and we never intend to go anywhere else -- it has everything we could hope for and more! This year we had the pleasure of noticing the many upgrades and improvements the current owners made since they acquired the property between our visits, and their loving attention to detail is apparent with everything from the landscaping to the decor. As you can tell from the photos, a house cannot get any closer to the water's edge than this one does, leaving you literally surrounded by the lake throughout your stay. The private pebble beach that IS the front yard is perfect for swimmers, especially kids: there's a nice, gradual entry to the clear, warm water and one can stand even beyond the end of the dock. The home is recently updated, freshly painted, clean, tastefully decorated, and generously equipped. The house is located just a couple of minutes away from Penn Yan, providing convenient access to stores and restaurants throughout your stay. Special thanks go to the current owners, the Vieselmeyers, who welcomed our whole family graciously and made us feel like family. Anyone would be hard pressed to find a more perfect getaway in the Finger Lakes than Eastview Cottage! The exterior features include natural beach and retaining wall in front of the home, a large dock to moor your boat, large covered porch for entertaining, gas grill for all your outdoor cooking, fire pit with Adirondack chairs for evening campfires, roasting s'mores or just relaxing. Water depth is gradual so you can wade in, place a chair in the water or enjoy excellent swimming right from our beach and dock. Young children can enjoy playing on the beach or safely swimming in our shallow waters. Enjoy a beverage tour by limousine; take a bike ride around the beautiful Amish countryside; go shopping at the Windmill Farm & Craft Market; visit Garrett's Chapel; hike or bicycle the local Keuka Outlet rail trail; hike or hunt in Letchworth Park (USA Today Readers' Choice #1 Best State Park in NY); relax on our spacious covered porch with a cup of coffee to watch the sunrise in the morning or with a glass of wine to watch the last rays of sun in the evening; toast marshmallows in the stone fire pit while you relax and unwind in the Adirondack chairs. Whatever you decide to do--once you visit, you'll return again and again to our beautiful Eastview Cottage! Located just minutes away from Penn Yan and all the conveniences of home. We're right on the Keuka & Seneca Beverage Trails in quaint Amish country! Enjoy the lake, see Amish horse & buggies, visit local farmers' markets, tour the local wineries, breweries and distilleries, listen to summer concerts on the lawn in town, eat homemade ice cream at Seneca Farms, dine at some of the finest restaurants or shop 15 min. away at the Windmill Farm & Craft Market with over 200 vendors. With so many features & activities, this home will quickly become a favorite vacation destination for guests visiting the Finger Lakes Region! Other Activities: Souvenir shop at Windmill Farm & Craft Market with over 200 vendors, in quaint Penn Yan, in other local small towns or around the Amish countryside; take a tour of the local beverage trails with wineries, breweries and distilleries, as well as specialty cheeses, chocolate and more; hike or bicycle on the Keuka Outlet Trail and local parks; enjoy swimming, sailing, fishing and jet-skiing on Keuka Lake; play golf at the Lakeside Country Club or eat at their Vines Restaurant; try your skills at mini-golf; visit the Yates County History Center with three museums; or take in a new-release movie for a quiet evening. $15 per person for linens/bath towels. ~~~~~~~~~~~~~~~~~~~~~~~~~~~~~~~~~~~~~~~~~~~~~~~~~~~~~~~~~~~~~~~~~~~~ Reserve Your Beverage Tour, Girl's Get-together, Family Vacation or Reunion now! Don't wait! Book your vacation now!